As per our fibreglassing guide we recommend that you should use either 1 layer of 600gm or 2 layers of 450gm fibreglass matting, for this example we will be using 1 layer of 600gm fibreglass matting. If you allow for 2.5 litres of Fibrelast base per square metre, this should give you an excellent pin hole free coverage. Laminating is a term that describes the application of catalysed resin to the fibreglass matting. 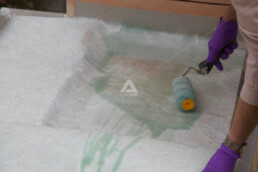 Start off by mixing a small amount of resin to laminate any details like pipework and trim overlaps. Laminate the fibreglass bandage around the trim to deck joints along with the decking joints if you haven’t used a T&G board. 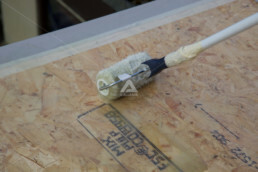 Place the pre-cut fibreglass section over the saturated deck and apply more catalysed Fibrelast resin over the top of the fibreglass. 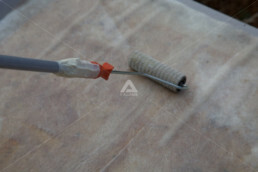 Allow the fibreglass and Fibrelast resin mix to activate the binder before working the resin through the fibreglass with a consolidating roller.